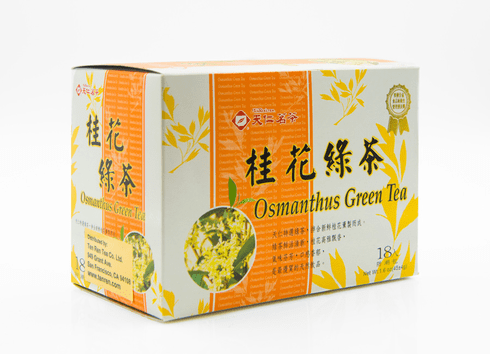 Ten Ren's Osmanthus Green Tea bags consists of Green Tea blended with Osmanthus. When steeped, the tea has golden yellow hue, a smooth taste, and a light pleasant floral sweet aroma. Osmanthus is an evergreen shrub with attractive foliage and clusters of small, very fragrant flowers. These flowers are also used in some of the world's most famous and expensive fragrances. Steep with hot water for approximately 2 minutes or until desired concentration. Each box has 18 individually sealed tea bags. Dimensional shipping weight is 0.72 lb.